Dominic Inouye, founder of ZIP MKE, speaks to a crowd at the opening of the photo exhibit. Photo by Camille Paul. Hanging on the balsa wood frames in the Milwaukee Public Library’s Schoenleber Reading Room are photographs representing the city’s 28 ZIP codes. The photos feature children posing or playing with one another, portraits of men and women, Wisconsin landmarks such as Leon’s and the BMO Harris Bradley Center, and events such as Jazz in the Park or Chill in the Park. The photographs are part of an online gallery and traveling exhibit called ZIP MKE, which is intended to showcase Milwaukee’s diversity. “We are a city of 600,000 unique faces, 600,000 unique experience of the world and 600,000 unique perspectives,” said Dominic Inouye, founder of the project and one of its photographers. The collection includes more than 900 photographs taken by neighborhood residents and Inouye’s team of photographers. Elizabeth Wendt and Kenneth Platt view the exhibit. Photo by Camille Paul. Inouye, writer-in-residence at The Pfister Hotel and a former teacher, said that he wanted to unite Milwaukeeans after the unrest in Sherman Park last August following the police killing of Sylville Smith, a 23-year old black man. “Milwaukeeans, including me, needed to see each other’s faces [as] the first step of uniting us to actions that could improve the divisions and disparities in our communities,” he said. Husband and wife Kenneth Platt and Elizabeth Wendt, who live in the 53207 ZIP code, visited the exhibit at its opening on Saturday. 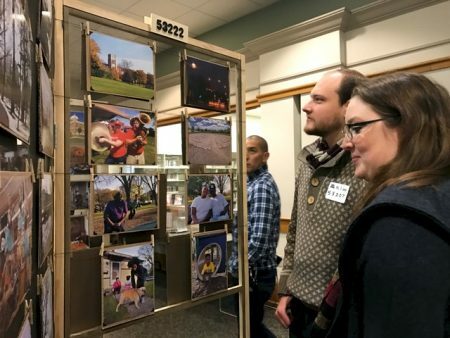 Inouye plans to display the exhibit at other Milwaukee Public Library branches around the city, including Tippecanoe, Mill Road, Atkinson and the East Branch. ZIP MKE will remain at the Central Library until Feb. 19. 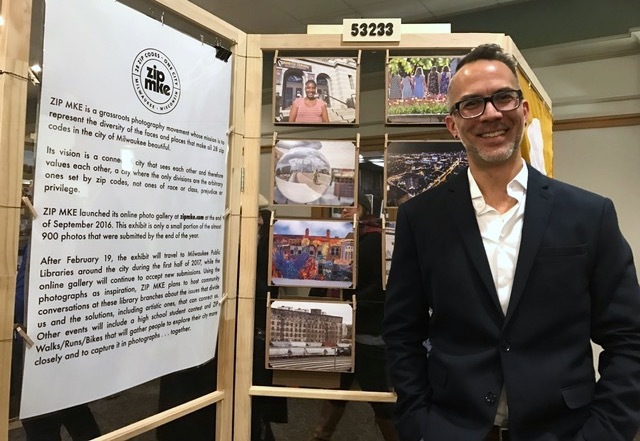 Referring to the decision to exhibit the photos at the library, Inouye said, “It’s the people’s place.” He added that he wants to make sure that people in ZIP codes throughout the city know about the project and contribute photographs to the online gallery. Zachary Lifton, who recently moved to Milwaukee from Pittsburgh, came to the exhibit to help gain a better knowledge of his new city. Refreshments at the event were catered by Tandem, The Juice Kitchen and Gloria’s Cake Shop and Café. “I think it’s really nice,” Teresa Moore said about the exhibit. “They are trying to show people the different sides of Milwaukee,” added Moore, a Tandem employee who lives in the 53216 ZIP code. Venice Williams, director of Alice’s Garden and The Body & Soul Healing Arts Center, told those gathered at the exhibit that she expected to stay in Milwaukee for two years when she moved from Pittsburgh 28 years ago.